Take the ultimate journey into the unknown with the heart-pounding sci-fi thriller “The Cloverfield Paradox,” arriving on Blu-ray and DVD Tuesday Feb. 5, from Paramount Home Media Distribution. 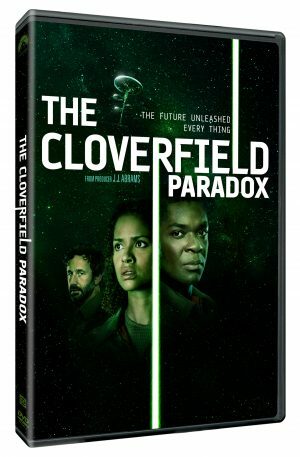 Featuring more than 25 minutes of never-before-seen bonus content including behind-the-scenes interviews with the cast and crew, the film will also be available as part of the new “Cloverfield” three-movie collection on Blu-ray and DVD. The third film in producer J.J. Abrams’ “Cloverfield” franchise, “The Cloverfield Paradox” follows a group of scientists orbiting Earth on the brink of a devastating energy war. They prepare to test a device that could provide unlimited power or trap them in a terrifying alternate reality. The film features a sensational international cast including Daniel Bruhl (“Captain America: Civil War”), Elizabeth Debicki (“Guardians of the Galaxy Vol. 2”), Aksel Hennie (“Hercules”), Gugu Mbatha-Raw (“A Wrinkle in Time”), Chris O’Dowd (“Get Shorty”), John Ortiz (“Silver Linings Playbook”), David Oyelowo (“Selma”) and Ziyi Zhang (“Crouching Tiger, Hidden Dragon”). The Blu-ray and DVD each include a making of documentary that delves into the inspiration for the story and how the film went from concept and design to completion. The discs also include interviews with the cast as they reflect on the experience of bringing the sci-fi thriller to life. The heart-pounding thriller “The Guilty” arrives on Blu-ray, DVD and Digital HD Tuesday Feb. 5, from Magnolia Home Entertainment. When police officer Asger Holm (Jakob Cedergren) is demoted to desk work, he expects a sleepy beat as an emergency dispatcher. That all changes when he answers a panicked phone call from a kidnapped woman who then disconnects abruptly. Asger, confined to the police station, is forced to use others as his eyes and ears as the severity of the crime slowly becomes clearer. The search to find the missing woman and her assailant will take every bit of his intuition and skill, as a ticking clock and his own personal demons conspire against him. This innovative and unrelenting Danish thriller uses a single location to great effect, ratcheting up the tension as twists pile up and secrets are revealed. Director Gustav Moller expertly frames the increasingly messy proceedings against the clean Scandinavian sterility of the police department, while Cedergren’s strong performance anchors the film and places the audience squarely in Holm’s tragically flawed, yet well-intentioned mind space. “The Guilty” is available for a suggested retail price (SRP) $29.98 for the Blu-ray and $26.98 (SRP) for the DVD. A heartwarming story about siblings and their passion to help sea life, “Bernie the Dolphin” arrives on DVD and Digital Tuesday Feb. 5 from Lionsgate. The film is currently available On Demand. In this family adventure starring Lola Sultan (“Monsters at Large,” “In Dubious Battle”) and Kevin Sorbo (“Hercules: The Legendary Journeys”), two siblings befriend a dolphin and devise a clever plan to save the beach and protect sea life, including their new dolphin friend, Bernie. Also starring Patrick Muldoon (“Starship Troopers,” “Melrose Place”) and Logan Allen (“Talia in the Kitchen”), the film is approved by the Dove Foundation for all ages. The “Bernie the Dolphin” DVD will be available for the suggested retail price of $14.98 and includes a behind-the-scenes featurette. The Mystery Inc. gang heads to the snowy peaks of the Himalayan mountains to track down a lost chest that contains the spirits of 12 captured ghosts on “Scooby-Doo! and the Curse of the 13thGhost,” an all-new, full-length animated film available on Digital and DVD Tuesday Feb. 5, from Warner Bros. Home Entertainment. It’s an action-packed adventure the whole family can enjoy together as the lovable Great Dane and the teen sleuths embark on a thrilling voyage to find the lost chest and capture the 13th ghost—the one that got away. Based on the classic animated television series “The 13 Ghosts of Scooby-Doo,” in this all-new film viewers will finally learn the identity of the 13th ghost—a mystery that has never been revealed before. “Scooby-Doo! and the Curse of the 13th Ghost “will retail for $19.98 SRP. After the Mystery Inc. gang goofed up a case and nabbed an innocent man, they’re forced into early retirement from crime solving. It’s not long however, before their old friend Vincent Van Ghoul needs help and pulls the team right back into action. The gang has unfinished business they must tend to, which involves catching a ghost that previously got away. It all happened one summer while Velma and Freddy where away at camp. Scooby-Doo, Shaggy and Daphne secretly hunted down 12 of the world’s spookiest ghosts but failed to catch the most evil one of them all—the 13thghost. Now the elusive spook is wreaking havoc. Vincent needs help having him captured and confined to the chest of demons, a box that contains the other 12 captured ghosts. With the 13th ghost still on the loose, the gang will have to come out of retirement and finish the job once and for all. The chest however, is now located somewhere in a remote village in the Himalayas. Determined to help Vincent, the gang sets out on one of their most thrilling adventures yet. Bundle up and get ready for the icy slopes of the Himalayan mountains, chilling car chases, crystal balls and spine-tingling spells in this terrifyingly fun original movie. “Grand-Daddy Day Care” arrives on DVD, Digital and On Demand Feb. 5 from Revolution Studios, and Universal 1440. When Frank Collins (Reno Wilson, “Transformers” franchise, “Good Girls”) suffers from writer’s block, he decides to start a day care for his father-in-law (Danny Trejo, “Machete,” “Dead Again in Tombstone”) and other seniors as a way to make quick cash, while giving him time to still work on his next book. Eventually getting a small group to care for, Frank soon learns that these are not your typical seniors and they can’t be easily corralled. With a code enforcement officer challenging the legality of his business, and his senior charges getting into all kinds of trouble, Frank’s work days become anything but effortless. The supporting cast includes Barry Bostwick (“The Rocky Horror Picture Show”), Linda Gray (“Hilton Head Island”), Julia Duffy (“The Cool Kids”), Alec Mapa (“You Don’t Mess with the Zohan”), Garrett Morris (“Saturday Night Live”), Margaret Avery (“Being Mary Jane”), Roxana Ortega (“The Loud House”) and George Wendt (“Cheers”). “The Golem” arrives on Blu-ray, DVD and VOD Tuesday Feb. 5. A reimagined period horror version of an old mystical legend, “The Golem” tells the story of a Jewish community in a shtetl that is besieged by deadly intruders. Set in 17th century Lithuania, the film focuses on Hanna (Hani Furstenberg, “The Loneliest Planet,” “Campfire”) a wistful, conflicted wife of the local rabbi’s son Benjamin (Ishai Golen, “Prisoners of War,” “The Last Patrol”), who secretly turns to Jewish mysticism and The Kabbalah to conjure up a dangerous entity to protect her community. But the creature she molds out of mud and summons to life echoes her tragic past and becomes so dangerously connected to its creator, that Hanna can’t see what a heartless monster she has fashioned from abject fear and desperate loathing. “The Golem” is directed by Doran Paz and Yoav Paz. Third generation directors, The Paz Brothers started working in the film industry at young ages. “The Golem” is their second collaboration with Epic Pictures and the first with Dread. The film is written by Ariel Cohen and produced by Shalom Eisenbach. Patrick Ewald and Shaked Berenson serve as executive producers. “Widows” arrives on 4K Ultra HD, Blu-ray and DVD Tuesday Feb. 5. From Academy Award winner Steve McQueen (director of “12 Years a Slave”) and writer Gillian Flynn (“Gone Girl”) comes a thriller with a stellar cast, including Oscar winner Viola Davis (“Doubt”), Michelle Rodriguez (“Fast and the Furious” franchise), Elizabeth Debicki (“The Cloverfield Paradox”) and Cynthia Erivo (“Bad Times at the El Royale”). Four women, with nothing in common except a debt left by their dead husbands’ criminal acts, conspire to take fate into their own hands. The action-packed thriller features Colin Farrell (“The Lobster”), Robert Duvall (“Tender Mercies,” “Apocalypse Now!”) and Liam Neeson (“Schindler’s List”). One of Acorn TV’s most popular series returns with the DVD debut of “800 Words: Season 3, Part 2” on Tuesday Feb. 5. The second half of the third season of this heartwarming series continues the saga of George Turner (Erik Thomson, “Packed to the Rafters,” “The Code”), a man making a home for himself and his family in a strangely beautiful and quirky New Zealand coastal town. The two-disc DVD set features eight episodes ($49.99, Amazon.com). “800 Words: Season 3, Part 2” made its U.S. premiere last August on streaming service Acorn TV. Australian newspaper columnist George Turner and his family have settled into their lives in New Zealand, but things are far from calm in their small coastal town. Following the wedding of his friend Woody (Rick Donald, “A Place to Call Home”), George begins dating someone new, providing endless fodder for the gossiping townsfolk. George’s teenagers face their own relationship issues as Shay tries to get over her messy breakup, and Arlo (Benson Jack Anthony) becomes romantically involved with two girls at once. Later, the citizens of Weld fear that their town may be taken over by a neighboring community, and the Turners are rocked by revelations about the death of George’s wife a few years earlier. Filled with gorgeous scenery, quirky humor, and heartfelt moments, this award-winning dramedy also stars Bridie Carter (“McLeod’s Daughters”), Emma Leonard (“Home and Away”), Michelle Langstone (“The Almighty Johnsons”) and Jonny Brugh (“What We Do in the Shadows”).